1National Tea and High Value Crops Research Institute Shinkiari, Mansehra, Pakistan; 2Department of Agricultural Chemistry, The University of Agriculture Peshawar, Khyber Pakhtunkhwa, Pakistan; 3Department of Genetics, Hazara University Mansehra, Pakistan. Abstract | Radish (Raphanus sativus L.) seed oil extract was analyzed for the presence of potential non-volatile phytochemicals and in vitro antibacterial activity against two phytopathogenic bacterial species (Clavibacter sp. and Xanthomonas sp.) and a human pathogenic bacterium (Escherichia coli) in 2016. Experiment was carried out by using complete randomized design with three replications in vitro. Phytochemical analysis reveals that the methanolic fraction of oil possesses metabolites like carbohydrates, amino acids, alkaloids, flavonoids and glycosides. To test the antibacterial activity of the extracted seed oil, Agar well diffusion assay was employed. Effectiveness of the oil against selected bacterial species was measured in terms of zone of inhibition in millimeters. Amoxicillin was used as a positive control. The results showed that Clavibacter sp. and E. coli exhibit resistant to the oil extract while Xanthomonas sp. displayed nil results. The present study thus reveals that either the used bacterial species are more resistant strains or the oil extract does not possess anti-pathogenic agent against tested bacterial species. Citation | Khan, N., A. Waheed, F.S. Hamid, N. Ahmed, Z. Iqbal, S. Ali, M. Bashir and H. Gul. 2018. Phytochemical screening and antibacterial assay of radish seed oil on selected pathogenic bacterial species in vitro. 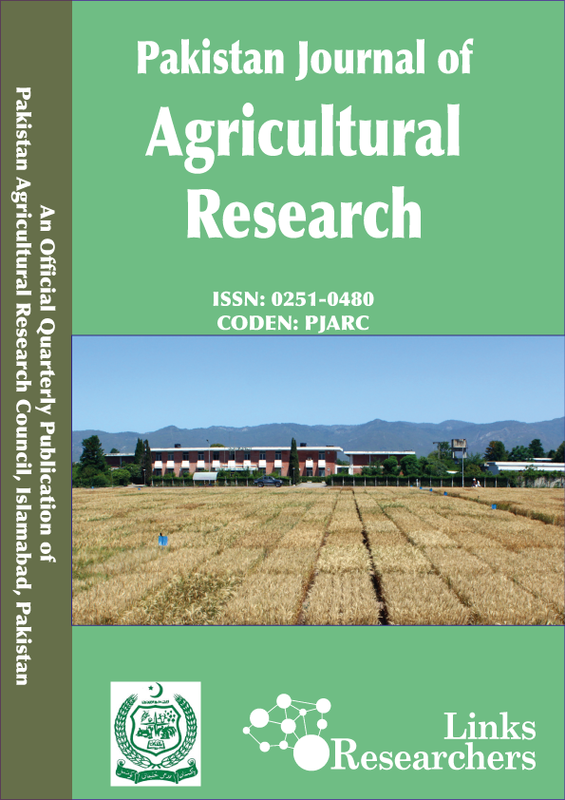 Pakistan Journal of Agricultural Research, 32(1): 46-51. Plants are a valuable source of phytochemicals refers to as secondary metabolites or natural products. These metabolites are identified to be useful in plant management and maintenance of human health, therefore could explain the use of plants extract as antimicrobial factor for prevention/treatment of several diseases in humans and other plants. Phytochemicals used for prevention or management of plant diseases are known as biochemical pesticides (Seiber et al., 2014). A renewed interest in plant based antimicrobials has arisen during the last twenty years, but still plant based antimicrobials are poorly explored. Screening of plants extracts for antimicrobial activity has shown that Brassicaceae plants represent a potential source of anti-microbial compounds (Prasad et al., 2015). Radish, Raphanus sativus L. var. longipinnatus of Brassicaceae family is widely grown all over the world and its total yield per hectare in Pakistan is 16.41 tons (GoP, 2016). Extract of R. sativus is previously reported with a diverse range of metabolites with regard to biopharmaceuticals (Lugasi, 2005; Kim, 2011) and biopesticides (Javaid and Bashir, 2015). Aqueous extract of the whole plant is found potent against bacterial strains like Sarcina lutea and Staphylococcus epidermidis (Caceres, 1987). Parts of the plant; like leaves, roots and seeds have also been analyzed individually for antimicrobial activity and found active against many pathogens (Javaid and Bashir, 2015). Seeds of radish are rich source of chemical compounds like phenols, alkaloids, glycosides and sterols (Gutiérrez and Perez, 2004); these compounds are believed to potential against several pathogenic microbes (Candido, 2011). The main objective of this study is to assess non-volatile phytochemicals and antibacterial property of radish seed oil against selected bacterial species. Radish seeds were collected from the fields of National Tea and High Value Crops Research Institute (NTHRI), Shinkiari, in April 2016. Seeds were separated from stems and kernel manually and dried for 48 hours at 105 °C. The seeds were milled, sieved by particle size (d<0.4 mm) and kept in a desiccators until use. Oil from radish seeds was extracted with petroleum ether using Soxhlet apparatus. Powdered seeds sample of 10 mg was loaded to thimble and placed into the extractor. Oil was extracted continuously for 8 hours with 35 °C (Wang et al., 2011). After extraction, petroleum ether was evaporated by using rotary evaporator and crude was collected for antibacterial study. An amount of oil extract was mixed with equal amount of 10% aqueous methanol. After an hour a quiet immiscible layer of two solvents petroleum ether and methanol was formed. Aqueous methanolic fraction was collected and evaporated to crude formation for phytochemical tests. Microbial species used in the study were plant pathogenic bacteria including Clavibacter sp., and Xanthomonas specie and a human pathogenic bacteria Escherichia coli. The microbes were obtained from the Department of Agricultural Chemistry, University of Agriculture Peshawar, Pakistan. These microbial species were recultured using Luria Bertani (LB) broth at 37 °C in incubator and maintained at 4°C. Screening of antibacterial assay was then carried out by well diffusion technique (Rojas et al. 2006). The potato dextrose agar (PDA) plates were seeded with 0.1 ml of the recultured inoculum of each test organism. The inoculum was evenly spread over PDA plates using a wire loop. A standard cork borer of 6 mm was used to cut uniform wells on the surface of the plate and 100 µL radish seeds extract was introduced into the wells. Amoxicillin was used as a standard antibiotic agent. The inoculated plates were incubated at 37° C for 24 hours and zone of inhibition was measured in terms of millimeter (mm). Proximate moisture content and ash content was determined according to Association of analytical communities (AOAC) standard methods 950.46 and 942.05, repectively (Horwitz, 2000). W1 is weight of sample (g) before ashing and W2 is weight of sample (g) after ashing. Test for carbohydrates: Molisch test: About 1 mL of methanolic extract was treated with 2-3 drops of Molisch’s reagent (10% of 1-napthol in ethanol). The test tube was hold at an angle and 1-2 mL of conc. H2SO4 was added carefully along the sides of the test tube and observed for the formation of reddish violet ring at the junction (Trease and Evans, 1983). Test for amino acids: 2 mL of methanolic extract was treated with 2-5 drops of ninhydrin solution placed in a boiling water bath for 1-2 minutes and observed for the formation of purple colour. Test for alkaloids: Mayer’s reagent test: 1 mL of 1% HCl was added to 3 mL of methanolic extract in a test tube. The mixture was heated gently for 20 minutes, allowed to cool and filtered. After this, two drops of Mayer’s reagent were mixed in 1 mL of extract and observed for turbidity or creamy precipitates (Idu and Igeleke, 2012). Test for polyphenols: Methanolic extract of 2-3 mL was treated with few drops of 10% aqueous FeCl3 and observed for the emergence of blue green colour (Trease and Evans, 1989; Sofowora, 1993). Test for flavonoids: To 1 mL of methanolic extract, few drops of conc. H2SO4 were added along the sides of test tube. The formation of yellow colour indicated the presence of flavonoids (Trease and Evans, 1983; Idu and Igeleke, 2012). Test for glycosides: Methanolic extract of 2.5 mL was treated with 5 mL of conc. H2SO4 and boiled for 15 minutes in water bath. This mixture was cooled and neutralised with 20% KOH. Three drops of FeCl3 was added to one half of the mixture and observed for green to black precipitates (Trease and Evans, 1983; Sofowora, 1993). Test for tannins: KOH test: 1 mL of freshly prepared 10% KOH was added to 1 mL of methanolic extract. Dirty white precipitates indicated the presence of tannins (Sofowora, 1993; Evans et al., 2002). Test for saponins: Froth test: 2 mL of methanolic extract was taken in a test tube, shaken vigorously and observed for froth formation (Idu and Igeleke, 2012). All the experimental treatments were performed in triplicates and analyzed statistically and observe at level of significance P>0.05 of probability. Radish seeds were found containing a high amount of oil content approximately 50% of total seeds weight. Sunflower seeds containing 40-45 % oil content and is known as one of the highest oilseeds plants (Martinez et al., 2015). Average 4.03% methanolic extract was fractionated from the total oil extract. The seeds were found to contain with 9.25% moisture content and 8.01% ash content. Table 1: Proximate composition of radish seeds. The symbol ± shows standard deviation among results of triplicates. Screening of radish seed oil showed presence of most of tested non-volatile compounds. These compounds were comprised of carbohydrates, amino acids and phytometabolites. Phytometabolites are regarded as plant natural products, which serve a defense mechanism against many microorganisms (Bonjar et al., 2004). Raphanin, a glycoside is the main constituent in radish which is responsible for its antimicrobial activity (Duke and Ayensu, 1985; Brown, 1995). Table 2: Phytochemicals in methanolic fraction of radish seeds oil. In the table, + sign denotes presence of the compound while – sign indicates absence of the compound or presence in trace amount. In the present study, polyphenolic compounds were not detected in the oil while flavonoids test showed positive result. The results may indicate that most of phenolic compound might be insoluble in petroleum ether (solvent used to extract radish oil) and flavonoids may present in trace amount or not favor to be detected with FeCl3 test. The antibacterial study of radish seed oil was performed by agar well diffusion method against the selected bacterial species and their activity aptitudes were qualitatively assessed by presence or absence of inhibition zone. Three different bacterial species were used i.e., (i): Clavibacter sp., (ii): Xanthomonas sp. and (iii): Escherichia coli. Clavibacter and Escherichia coli showed resistant against the oil extract while Xanthomonas sp. did not shown growth on any PDA plate and represented as nil activity. Nil results of Xanthomonas sp. may show that the specie could not resist to the temperature on which it was kept i.e., 37 °C or PDA might not suitable media for its growth. Some bacteria are naturally resistant to certain antimicrobial components. According to previous studies, it has been found that radish extract is strongly active on many bacterial species (Abdou, 1972; Shukla et al., 2011). The seeds are also believed to contain antibacterial compounds such as raphanin, a glycoside and antimicrobial component (Duke and Ayensu, 1985; Brown, 1995) which is active against E. coli (Shukla et al., 2011; Yeung, 1985). Researchers identified that bacterial pathogens are adapting the ability of resistance by genetic mutation or by acquiring resistance from another bacterium. Resistant rates in E. coli are also rapidly growing against many antibiotics (Laupland et al., 2008). Substantial fall in resistant E. coli will occur if sterile food is consumed (Corpet, 1988). *A and B plates show culture of E. coli while C and D show culture of Clavibacter specie. Table 3: Diameter of zone of inhibition of radish seed oil including positive control on selected bacteria. SD is standard deviation among replicated samples. Phytochemical tests detected presence of many compounds including carbohydrates, amino acids alkaloids, flavonoids, and glycosides in radish seeds. Presence of these phytometabolites assumed potency of radish seed extract against pathogenic microbes and other human and plant diseases. Antibacterial assay performed against pathogenic bacterial species showed that Clavibacter sp., and E. coli were susceptible to amoxicillin (positive control) by inhibiting approximately 18 mm in both bacterial species but resistant to radish seed oil. Xanthomonas bacterial sp. did not show any results. Thus, it is concluded that either the used bacterial species are more resistant strains or the oil extract does not possess anti-pathogenic agent against tested bacterial species. The authors are grateful to the department of Agricultural Chemistry, The University of Agriculture Peshawar, Pakistan for the provision of bacterial culture and availability of laboratory equipment for utilization. Nadia Khan: Designed and practically performed. Abdul Waheed and Farrukh Siyar Hamid: Supervised the complete experiment. Naveed Ahmed: Review of literature and correction in final draft. Zafar Iqbal: Supervised and helped out in extraction of Radish seed oil. Madiha Bashir: Made draft paper. Hina Gul: Collection of data. Abdou, I.A. 1972. Antimicrobial activities of Allium sativum, Allium cepa, Raphanus sativus, Capsicum frutescens, Eruca sativa, Allium kurrat on bacteria. Qualitas Plant. 29-35. Brown, D. 1995. Encyclopaedia of Herbs and their Uses, Dorling Kindersley, London, UK. Duke, J.A. and Ayensu, E.S. 1985. Medicinal Plants of China. 1st edn. Ref. Publ. Inc., China. Evans, W.C., Trease and Evans. 2002. Pharmacognosy. 15th edn. W.B. Sounders and Co., London. GoP. 2016. Fruits, Vegetables and Condiments Statistics of Pakistan 2014-15. Ministry of Food and Agriculture (Economic wing). Partners available at: http://www.amis.pk. Horwitz, W. 2000. Volume: Official Methods of Analysis, AOAC International: 17th edn. Idu, M. and Igeleke, C.L. 2012. Antimicrobial Activity and Phytochemistry of Khaya senegalensis Roots. Int. J. Ayur. Herb. Med. 2: 415-422. Javaid, A. and Bashir, A. 2015. Radish extracts as natural fungicides for management of Fusarium oxysporum F. Sp. Lycopersici, the cause tomato wilt. Pak. J. Bot. 47: 321-324. Martinez, F.E., Dunford, N.T. and Salas, J.J. 2015. Sunflower: Chemistry, Production, Processing, and Utilization, Elsevier. Shukla, S., Chatterji, S., Yadav, D.K. and Watal, G. 2011. Antimicrobial efficacy of Raphanus sativus root juice. Int. J. Pharm. Pharma Sci. 3(5) : 89-92. Sofowora, A. 1993. Medicinal Plants and Traditional Medicine in Africa, Spectrum Books Ltd., Ibadan. Trease, G.E. and Evans, W.C. 1983. Pharmacognosy. 12th edn. Balliere Tindall, Eastbourne, U.K.
Trease, G.E., Evans, W.C. 1989. Pharmacognosy. 13th edn. ELBS London. Yeung, H.C. 1985. Volume: 1 Handbook of Chinese Herbs and Formulas, Inst. Chin. Med. Los Angeles, CA, USA.